Frag, the Italian company that transforms leather into a lifestyle concept, sailed to the East and impressed at the Salone del Mobile.Milano-Shanghai. Leather, was of course, the main attraction in Frag’s exhibit, which was kept classy with its two-toned dark walls that helped highlight the neutral colors of the furniture on display. The brand is known for its two-toned furniture. The Riviera, designed by Dainelli Studio, was prominently displayed in the showcase. This elegant lounge chair attracts with its frame and legs made of tubular polished steel or chrome. The metallic tubing certainly promotes modernism, which speaks of the brand’s ability to adapt considering its history of making leather furniture since 1921. The brass finish also hints of contemporary design. Of course, the cushion is made of leather. The leather is available in many colors. The armchairs were complemented with the two-piece Square tables designed by Christophe Pillet. 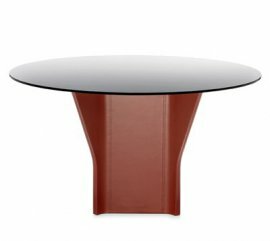 They are accent tables with lacquered tubular steel frames. A Doni table also made its way to Shanghai, paired with a pair of Clubby. The former, also playing with two tones, comprises a steel cylindrical base and a marble table top. One description that pops out when looking at the Clubby is cute. It has a cylindrical shape padded and upholstered in leather. The metallic swivel base has a brushed brass finish that wonderfully contrasts with the seat. Also included in the exhibit is the Cocoon lounge chair. This chair has a base made of solid walnut. It has padded cushions with leather upholstery. The Cocoon is comfort personified. Frag also had a dining set on display in Shanghai composed of the Argor table and comfortable Bella seats. The Argor has a black-painted round glass top and a base made of steel. The panels are covered in leather. Completing the set are the Bella chairs, two with armrests and two without. The Bella is the classic dining leather chair. It was Frag’s first time to join the Salone del Mobile.Milano Shanghai held at the Shanghai Exhibition Center from Nov. 22 to 24, 2018. It was the third edition of the Shanghai leg of the exhibit. The show was aimed at bringing the latest trends in “living Italian style” to the East. Frag, for its part, aims to solidify its presence in China. China is the perfect place for Frag to expand its market as the Asian country has quickly adapted to the Italian style of living. The showcase was a way for the Italian brand to bolster its presence in the Chinese market and Frag didn’t disappoint. Frag is at the forefront of exporting Italian luxury living to the East. The showcase was very timely as China is opening its market to a more posh and refined lifestyle. Nothing demonstrates luxurious living more than leather furniture. Tens of thousands of people dropped by the Salone del Mobile.Milano Shanghai to be dazzled by the different Italian furniture offerings. “The Salone del Mobile.Milano Shanghai is a strategic international appointment, which has grown exponentially thanks to the quality of the exhibition and the interest of a public increasingly aware of and sensitive to the values of design,” said Salone del Mobile president Claudio Luti of the exhibition. “We are making our return to China’s economic capital with great enthusiasm, in the firm belief that we will be able to further advance what is already a fertile commercial and cultural dialogue between the two countries,” Luti added.